Saracens put to bed the ghosts of 2014 as they claimed a 28-16 victory over Bath in a pulsating Aviva Premiership final at Twickenham on Saturday. Twelve months on from their extra-time heartbreak against Northampton, Mark McCall's side provided a masterclass performance in front of a record 80,589 crowd to become the first team outside of the top two after the regular season to win a Premiership title. First-half tries from Owen Farrell, the impressive Jamie George - who the previous day had replaced the suspended Dylan Hartley in England's World Cup training squad - and Chris Wyles ultimately did the damage as Bath failed to cope with Saracens' heavy pressure, playing into their opponent's hands with an array of misplaced passes. Both teams named unchanged sides from their respective semi-final victories, meaning Sam Burgess started at blindside for Bath looking to impress the watching England coaches, but it was Farrell who gave a man-of-the-match performance to stake his claim for the England No. 10 shirt. Jonathan Joseph had the Twickenham crowd roaring inside the opening exchanges with a kick down the line, but the Saracens 'wolf pack' defended their 22 astutely. Anthony Watson was left groggy after a seismic hit from Farrell, which saw the Saracens fly-half lucky to escape a yellow card from referee Wayne Barnes. It proved costly for Bath. After a loose kick from George Ford, Saracens spread the ball wide and Farrell was on hand to cross the whitewash with a smart dummy, with a groggy Watson one of the Bath bystanders. Farrell neatly added the extras from the resulting conversion, after which Watson - clearly still struggling from Farrell's early hit - was replaced by Ollie Devoto. And it soon got worse for Bath, as Saracens' increasing pressure paid off when George capitalised on a mistake from Ross Batty to intercept and race clear from 35 yards; Farrell went wide of the posts with his conversion. Watson's permanent substitution was confirmed on the 20-minute mark and Farrell rubbed salt into the wounds, landing a penalty following powerful work in the scrum from Mako Vunipola. That finally kicked Mike Ford's side into life. Semesa Rokoduguni brilliantly took a high ball, but again possession was wasted with a knock-on in the midfield. However, Bath finally got on the board 26 minutes into the opening half as shades of their free-flowing rugby began to show. Rokoduguni chipped down the touchline towards the Saracens' 22, but the Bath winger was clearly obstructed by Alex Goode. Referee Barnes deliberated before pointing to the posts, after which Ford kept his nerve to slot home. Twickenham shook as Burgess crashed into Billy Vunipola, but Bath simply failed to make any headway. The decisive blow came on the half-hour mark; another misplaced Bath pass was intercepted, this time by Duncan Taylor, who offloaded to David Strettle, only for the No.14 to fall short of the line. The move was kept alive and, despite a spilled pass from Mako Vunipola, Chris Wyles crossed over with ease before Farrell's successful conversion. The fly-half soon made it a 22-point lead, landing a penalty following David Wilson's infringement in the scrum in front of the posts shortly before half-time. However, Bath came out a different side in the second half; Ford reduced the deficit with a penalty after another high tackle from Farrell on Joseph. Rob Webber and Nick Auterac replaced Paul James and Ross Batty from the bench. 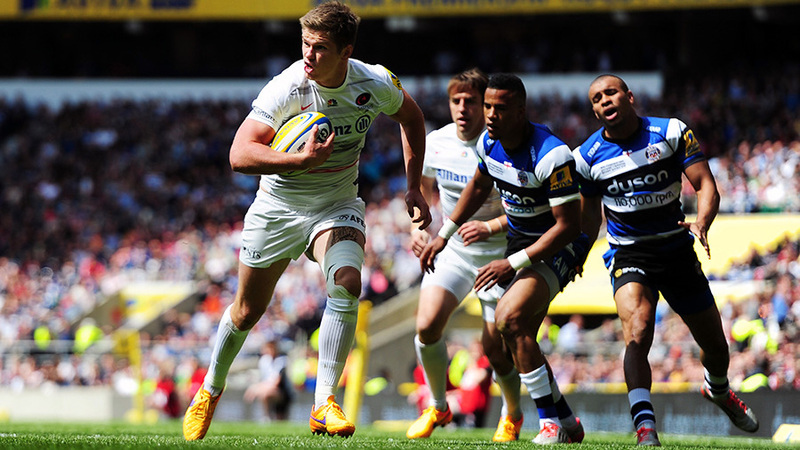 Webber had an immediate impact in the Bath scrum, before Ford made smart yards into the Saracens half. Kyle Eastmond broke clear, only to be denied by a last-ditch Petrus Du Plessis' tackle. However, Bath maintained their pressure and, after switching the ball from right to left, Joseph was on hand to sidestep his way across the line for their first try. Ford converted, before captain Stuart Hooper made way for Dominic Day. Neil de Kock replaced Richard Wigglesworth at scrum-half for Saracens as Bath began to turn the tide, with Ford kicking another successful penalty from a tight angle following George Kruis' lineout obstruction. Farrell, though, was allowed to restore a 12-point lead after Devote was called offside in the Bath ruck right in front of the posts. 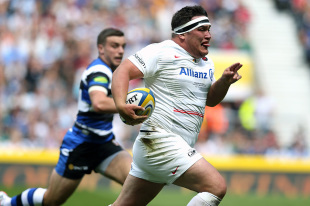 That stemmed Bath's momentum as a tiring Saracens side regained a foothold on the game. Farrell kicked into touch after two scrappy scrums, before Charlie Hodgson replaced Brad Barritt on the 70-minute mark. Bath's Peter Stringer - playing his final game for the club before joining Sale next season - made way for Chris Cook, but uncharacteristic handling errors, this time from Matt Garvey, made an attempted Bath comeback all the more difficult. A brilliant piece of improvisation from Chris Ashton almost provided a swansong ending for Saracens after Hodgson's turnover, but the Bath defence somehow kept the ball from crossing the line. Hodgson's late drop kick was pulled wide of the posts before Farrell was named man of the match and, following an 80th-minute scrum, Saracens were finally crowned champions in the southwest London sunshine.